Baeckea plants and species include Baeckea ramosissima or Rosy Heath Myrtle and Baeckea virgata a taller growing species to 2m and its dwarf form that will reach only 1m. Baekea are a drought tolerant plant once established and flowers can be cut for backing in floristry. Baeckea are found both in New Caledonia and Australia, some plants previously named as Baeckea have recently been reclassified, so watch for a little confusion here. Related to Leptospermum and they do have tea tree like flowers, drought tolerant. These are a reasonably tough plant and can be used for cut flowers. A well drained humus rich soil and a sunny position is best for Baeckea. 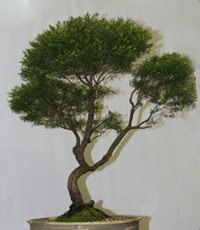 They are sometimes simply called ‘Heath Myrtle’. B. ramosissima is found across Southern Victoria and along coastal New South Wales. B. gunniana is a Tasmanian species. B. crenatifolia is a taller growing variety with white flowers.